There is something to say about a business that has been around for nearly 100 years and remains a staple to a downtown district on the National Register of Historic Places. 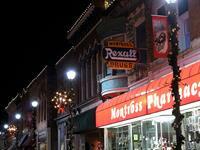 Montross Pharmacy has proudly been serving the Winterset community since 1921. We pride ourselves on providing friendly, professional service from local faces you can trust! Whether you are looking to process digital photos, pick up dry cleaning, pick up prescriptions, or get a vaccination, Montross Pharmacy has it all! While you are waiting for your prescription, be sure to give the soda fountain or new gift shop a visit! In addition to the wonderful pharmacy services, Montross Pharmacy is home to the oldest family owned restaurant in Madison County. This old-fashioned fountain boasts fantastic home-cooked meals, original cherry or vanilla cokes, and the best spot to grab a cup of coffee and catch up with a friend. Save room for a slice of pie! We are conveniently located on the north-west side of the historic Winterset square!